Before Regularly Scheduled Storm Game. More to come. PRIZE LIST IS LOCATED AT THE BOTTOM OF THIS PAGE. 2 VIP 3 DAY Festival Wristbands and 1 VIP Parking Pass. You will need to select the Festival you wish to attend and donate using the buttons below. You can make multiple donations and you can win multiple times. There will only be one winner per festival date. Additional prizes may include tickets to the FIRESTORM Casino Royal Event. Cal Fire employees currently enjoy "Defined Benefit", however certain wealthy individuals and groups are trying to push us into "Defined Contribution", you have to ask yourself, who benefits from this. Us, or the Brokerage Firms and Wall Street. Sara Thomas has been approved for a Type II Funeral. CAL FIRE, CAL FIRE L2881, The CAL FIRE Honor Guard, the CDF Firefighters Benevolent Fund and the Riverside County Professional Firefighters Benevolent Fund continue to work with the goal of supporting and fulfilling the needs of the Thomas family to help ease the burden of so many difficult decisions. 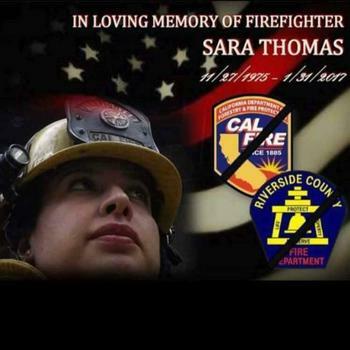 Indio Florist: Under "Firefighter Thomas"
Sara's memorial service is public; however, graveside services are private at the request of the family. We will continue to provide any updates as we near the memorial service date. Thank you for your unity and support as we navigate this difficult time for Sara's family and our firefighting community.